Gales, Sharks, Pirates...and a Baby?! Kelly and Paul set sail without any sailing experience...and experienced more than they ever dreamed. At 35 years old, Kelly and Paul Watts sold their home and quit their jobs to sail around the world, without any sailing experience. Two days after purchasing their forty-two-foot sloop, they got caught in a forty-knot gale off the coast of Cape Fear, NC. Their sails ripped; the engine overheated; the GPS broke; they suffered hypothermia and severe seasickness. And yet they persevered on their journey, discovering the playful seals of the Galapagos, the seductive dance of the Polynesian girls, and the primitive beat of Tuvaluan music, all while learning how to sail and repair their boat. They narrowly escaped a shark attack in Suwarrow, fled from suspected pirates off the coast of Ecuador, and hit a submerged container – the fear of all sailors - near Midway Island. What started as a search to find meaning to “life without children,” only strengthened their desire to have a family. After failed fertility attempts in New Zealand, they set sail north. A one-week visit in Kiribati turned into an eight -month stay as they unexpectedly adopted a two-month old baby, battled Dengue Fever and an epidemic of e-coli., and almost lost their lives in a 60-knot westerly gale. 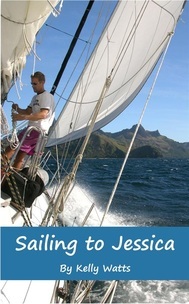 Told from Kelly’s conversational point of view, “Sailing to Jessica” is a modern-day sailing adventure that will inspire anyone who is searching for meaning in their life to get up and find it. An inspirational couple who...seized a moment leading to the kinds of memories that only a life at sea can bring - Tania Abei, author of "Maiden Voyage"
They did the next craziest thing: cruising. (So what if they didn't know how to sail--details, details.) - Janna Cawrse Esarey, author of "The Motion of the Ocean"